It seems, to me, somewhat ironic to write a manual on informal mentoring. A step-by-step guide to the unstructured method of disciple-making would be a bit ridiculous, and yet there is some level of guidance needed in considering how to best do this. Alvin Reid and George Robinson have been mentors for decades and their experiences serve well to guide readers in the becoming good mentors. With is a good illustration of what it looks like to mentor others. The use of the word “illustration” is intentional. The book is more descriptive than prescriptive, layered, as it is, with stories of informal mentoring. The two authors describe various scenarios and settings in which they were mentored and in which they have mentored others. The stories serve as perfect illustrations of the informal process of making disciples. Rather, than simply giving readers a step-by-step guide, a comprehensive strategy, they give readers tangible examples to mimic. The stories are helpful illustrations, then, of what readers ought to be striving for. The book’s title comes from the author’s conviction that “the best learning comes not from simply listening to a leader, but by being with one” (21). 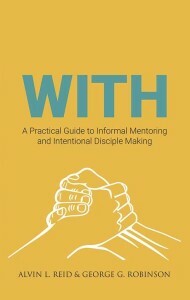 The book builds a definition of mentoring, then, that focuses on lifestyle and fellowship more than on instruction. They have both seen and experienced the truth that “more is caught than is taught.” This model is not, however, purely pragmatic, they see it most clearly in the disciple-making efforts of Jesus himself, and the whole of the New Testament. The book’s three parts develop their approach to informal mentoring. They begin with an apologetic for the method, defending its practice and defining it clearly. Part two turns to consider the model within the pages of the New Testament. The authors have been heavily influenced by the renowned practitioner Robert Coleman. Chapter three is basically a summary of Coleman’s classic work The Master Plan of Evangelism. They then turn attention specifically to Jesus’ mentoring of the twelve, and then conclude the section with a chapter on the example of Barnabas and Paul. Part Three turns attention to some of the practical considerations of mentoring today. Overall the book is a good little guide to the basic components of informal mentoring. The stories are the best part of the work. The authors exemplify what they instruct through their own personal ministries, families, and personal disciplines. They leave plenty of room for personal application and development, not offering a one-size-fits all approach to mentorship. Readers looking for something more thorough, theological, or philosophical will need to look elsewhere. Coleman’s work would be the best place for such subjects. With is a different kind of book. Because it focuses on the informal approach it is naturally less structured, but it will illustrate well the goal you are shooting for. Ted Kluck’s Dallas and the Spitfire is a more long-form example of informal mentoring, but this book establishes the basic guiding values and models them in snippets of real-life examples. What some of the larger books develop in theory is illustrated well in With. It will make a good companion tool for many who are interested in models of discipleship. Reblogged this on Xcaptive .